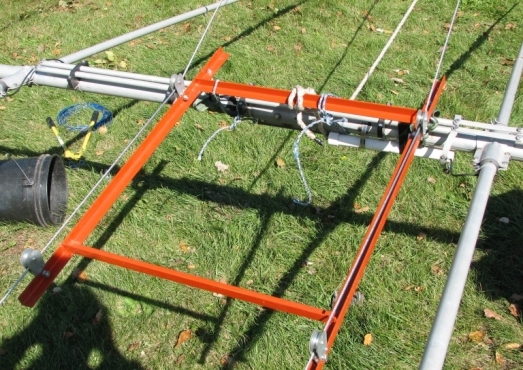 Raising large Yagi antennas can be a challenging project. A trolley system will make the job a lot easier. 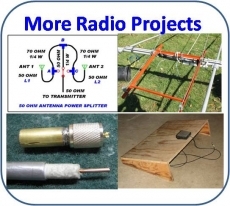 I first saw such a system in use a number of years ago when I helped out at an antenna party at the K9NS contest station. Frank had one that we used to put up a number of 10 meter beams. After that I decided I needed to build one for use at my own station. The trolley system consists of several parts. The main component is a cradle that holds the antenna, and has wheels to ride on the cables. Bars on the tower and on the ground keep the cables properly spaced. The cradle is made of welded angle iron. The picture shows the basic design. It is about 3’ wide. If I were to do it again, I would make it a bit wider for increased stability and for use on larger towers. Note how the front cross brace is placed back from the front. This is necessary to provide clearance once the antenna is at the tower. Pulleys mounted upside down on the frame act as the wheels. I drilled holes at the front for large U-bolts. These are to hold the boom of the antenna. This did not work on the TH-7 as shown in the pictures because of the matching system. I ended up tying the boom to the trolley with this antenna. 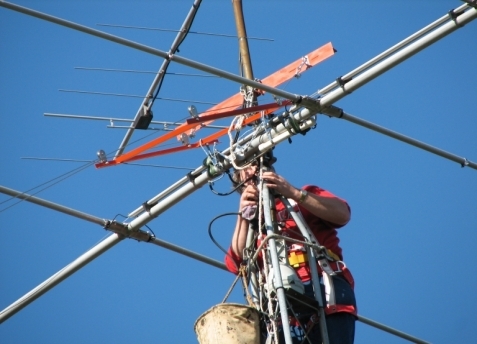 The U-bolt system is best if the antenna can use it, because the antenna won’t twist as it is hauled up. 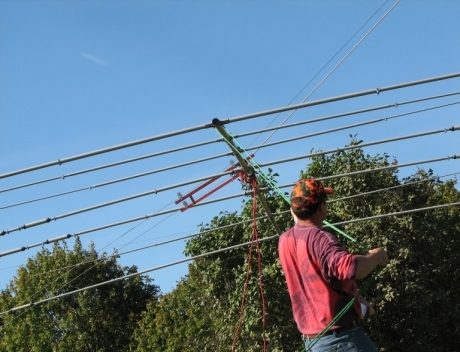 I had helpers on tag lines to keep the beam horizontal when doing the antenna work shown in the pictures. The top and bottom bars are made of angle iron welded to form a T-shaped bar. U-bolts hold the top bar to the mast. You can also drill holes to mount U-bolts to match the tower legs for side mounted antennas. Heavy duty eye bolts provide the connection points for the cables. The cables are steel and fastened to the top and bottom bars. The cables should be fairly taught. Do not use rope or other cable that stretches or it will get hung up at the front pulleys. Tower work is very dangerous. If you build one of these, build in extra strength for a safety factor. This puts a lot of side stress on the tower. Be sure the tower and guys can handle this stress. 1. Mount the top bar on the tower. 2. Attach the cables to the top. 3. Feed the other ends of the cables through the pulleys on the cradle. 4. Mount the cables to the ground bar. 5. Secure the ground bar with a number of heavy duty stakes pounded in the ground. 6. Mount the antenna on the cradle. 7. Attach a rope to the front of the cradle. 8. Pull the antenna up. The trolley system makes getting the antenna to the top of the tower go much smoother. Only a large crane would make the job go easier.